Thoughts from a Thirsty Bear: There is no such thing as "Pragmatic BDD"
There is no such thing as "Pragmatic BDD"
I practice, teach and coach Test Driven techniques. Test Driven Design (i.e. using unit tests), Behaviour Driven Development, I use them all on an almost daily basis. I find them useful since they help me do my main job of delivering software. Yet once in a while I am asked whether I could be more "pragmatic" and less "purist" over Test Driven Development and Behavioural Driven Development techniques. I always find this an odd request, especially when I have been brought in as the subject expert to teach a company, or as a lead developer with a solid grounding in these subjects. But maybe this is not obvious to some, especially those who have never used the techniques correctly - or at all. This article looks bit deeper into the request, and see why I am totally nonplussed by even the idea. Firstly, what does TDD and BDD (arguably the "pure" version of them) usually look like? To me they look like closely related cousins, which makes this brief summary simple. Both require you to define - normally in collaboration with the business, or other developers -what requirement you are going to deliver next, whether in the large (a behaviour of the system) or in the small (class/object contract). You could describe them both as red bar pattern techniques - a failing test - before you proceed. Once you have this failing test, the next step is to make the test pass. Once you satisfy the test, you are done. Seemples. 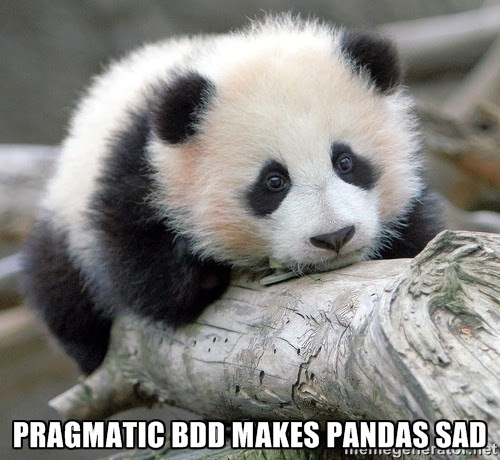 Bearing this in mind, let's think about what pragmatic TDD/BDD might be. Well, we can't really drop step 3, can we? Else we would never produce anything. Equally, we can't really drop step 1 in some form or another, else we would genuinely be like the infinite monkeys with typewriters desperately trying to reproduce Hamlet. That leaves the iteration and testing. Removing iteration from the process leaves you with what is generally accepted to be a waterfall process. You define everything up front. This can work. As long as nothing changes, and the requirement is sufficiently trivial that nothing can be missed. A big ask in my opinion and supported by rather a lot of first hand experience, but others' opinions may differ. But usually asking for a "pragmatic" approach is about reducing massively or removing completely the need to write tests first before doing anything. If you are not used to front-loading your project to fail-fast, and you don’t expect to see anything meaningful until towards the end, then it can feel like running through treacle at first - you don’t get that warm fuzzy illusion of progress that not having to deliver anything meaningful gives you. And the temptation is to rip the heart out of the approach - the very thing that makes it so effective. 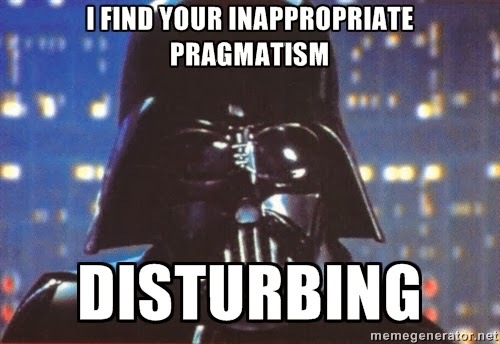 Digging deeper, what does this “pragmatic testing” really mean? Test what you feel like? Test what you have time for? Leave the rest to trust? Test it all later at the end? Or to put it another way “Where do you want your bugs, Mr Customer?” This is sounding like the Code Complete Fallacy in another form. Not good, eh? None of these have anything to do with applying TDD/BDD pragmatically. However they do say a lot about quality, professionalism, even honesty. It is about developing good or bad code. These techniques are about baking quality into the product rather than the impossible task of inspecting it in later. It is a very bad idea (not to mention nonsensical) to change the process. And here we have the heart of why I do not recommend compromising. Test driven techniques, coupled with an iterative approach, force you to demonstrate and practice your professional skills every day, day in day out. They validate the assumptions in your design and architecture as you go, feeding back information to help you understand your weaknesses and improve. Taking away this fast feedback loop but claiming it is still there is at best misguided, possibly disastrous, at worst dishonest. Face facts - if you aren't doing B/TDD right, you are not doing it at all. I believe it is that clear cut. Be courageous and recognise this and stop hiding behind the cowardly "pragmatist" excuse. Recognise what you are doing, and how it helps - or hinders - you. Then take the next step to getting it right. So next time you think you are being too purist, take a step back and think about what you mean, and what you are actually suggesting. I suspect you will be surprised. Long, long ago, in a galaxy far, far away, I worked with a consultancy where I was told that… I didn't stay long.